This weekend when we were in DC, we discovered how friendly the squirrels were. I had some raw almonds in my purse and we had so much fun feeding them as we traveled between memorials on the Mall. To give context, John and I have a bird feeder in our backyard, and it doesn't bother us that the squirrels come and feed there too. For years--when our dogs were younger and faster--the squirrels seemed to delight in teasing them. And our dogs (shelties, who are working dogs) loved the mission of keeping these dreaded enemies away from our property. John even got to feed a black squirrel...something I had never seen before. In working with sugar gliders, I've heard it explained that having a relationship with a wild animal isn't about whether or not they 'like you', it is about trust. An animal who trusts you, will interact with you. 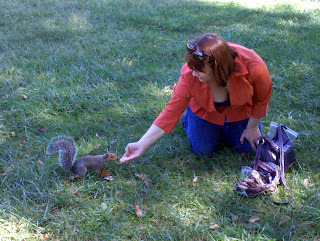 I think it is way cool that the squirrels on the Mall have learned to trust humans.